Iowa straw poll 2015: Will Mike Huckabee’s decision to sit out the event kill the early campaign season contest? 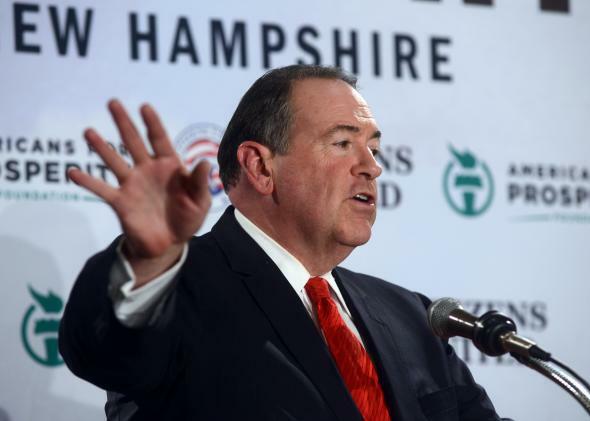 Did Mike Huckabee Just Kill the Iowa Straw Poll? Mike Huckabee speaks at the Freedom Summit at the Executive Court Banquet Facility on April 12, 2014, in Manchester, New Hampshire. Mike Huckabee will sit out this summer’s Iowa Republican straw poll, a major—and perhaps fatal—blow to a pre-election-year tradition that has served as an early, if less than reliable, test of strength for Republican presidential hopefuls. Huckabee broke the news in a Des Moines Register op-ed, writing that the cost of competing has grown so high that it no longer makes sense for non-establishment candidates like himself to compete. “It’s clear that pitting conservative candidates with limited resources against each other in a non-binding and expensive summer straw poll battle, while allowing billionaire-backed establishment candidates to sit out, will only wound and weaken the conservative candidates who best represent conservative and hard-working Iowans,” he wrote. The contest, which was first held in 1979, has turned increasingly expensive for GOP hopefuls, who in recent years have spent tens of thousands of dollars to bus in supporters and secure prime space for their tents at the event. A straw poll victory normally generates some good press, but not much else lately. In 2011, Michele Bachmann won the nonbinding poll but failed to have an impact on the nominating contests that followed. Mitt Romney, meanwhile, skipped the event but still went on to finish a close second in the caucuses on his way to locking down the GOP nomination. The straw poll has become unattractive to most candidates. Front-runners have little to gain but a lot to lose by spending big on an event that can be dismissed by rivals who sit it out as little more than a sideshow. Long shots and dark horses have more to gain from a free round of media attention, but most don’t have the cash they need to compete. Huckabee’s somewhere in the middle of that Venn diagram: He doesn’t have cash to burn but still would have faced sky-high expectations given his previous performances in Iowa, making it a high-risk, low-reward proposition for him. In hopes of saving their event, Iowa Republicans announced plans to scale back this year, but have so far had little luck. Jeb Bush had already announced he would not participate, and the rest of the GOP top tier has remained noncommittal. Huckabee’s decision is a much bigger blow to event organizers, though, given that his surprise second-place finish in the 2007 straw poll set the stage for his even more surprising victory in the Iowa caucuses the following year. He also made a cameo at the 2011 event to blast Romney and Rick Perry for sitting it out. “I think the candidates really don’t understand the value of retail politics,” he said then. If anyone could have saved the straw poll, Huckabee was probably the best bet. Given that the GOP field may be 20-strong by the time the Aug. 8 event rolls around, there will almost certainly be a handful of hopefuls who travel to Iowa to compete in the contest. But every bold-faced name that doesn’t will make a victory there less newsworthy. And Huckabee’s decision will provide cover for other GOP candidates who don’t want to devote their resources to competing in the straw poll. Unlike Bush, who has shown relatively little interest in campaigning in Iowa, Huckabee has already been on the ground early and often in the Hawkeye State. The former Arkansas governor won’t be competing in the straw poll, but it’s clear he’s competing in the state.